Current RGM&HS society members started receiving the March 2019 Green Light via e-mail starting this evening. 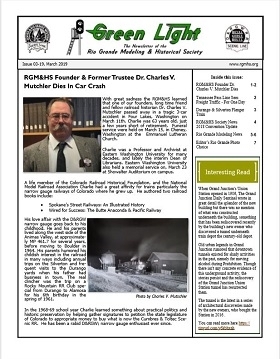 The March edition of the newsletter including society news, including an update on the 2019 RGM&HS Convention, "Rio Grande" news, photos. We welcome comments and feedback from the members who have received the Green Light. If you not a current member of the society and following us here please visit http://www.rgmhs.org and join today.